Here’s one of those movie franchises which I often forget exists. I’ve seen them all, though it’s probably been since high school that I’ve seen any of them. I remember very much liking this movie, but for some reason it didn’t stay stuck in my craw like DIE HARD did. But Liz and I were looking for a good mix of action a comedy, and this is where we landed. Watching this film, it was amazing to see just how much of it was lifted for later action flicks. BAD BOYS gets its core relationship from this film. Though they change it up a bit, we get the family man trying to make a living played off against the wild and crazy partner who does whatever he wants. THE NEGOTIATOR’s climax felt a bit like the climax of LETHAL WEAPON, albeit in a more cerebral way. Also, the witty banter, from a marvelous script by Shane Black, is certainly paid homage to in spirit throughout action buddy flicks of the 90s. 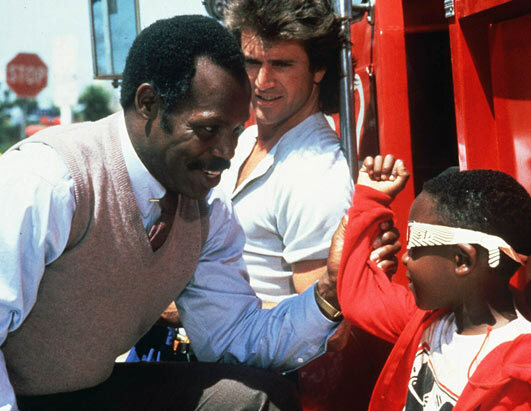 What makes LETHAL WEAPON so effective is that it doesn’t play like a film trying to launch a franchise. While the 80s music undercuts its emotional weight (the scene of Mel Gibson crying over his wife is not helped by sax and synthesizer), this movie cares about its lead characters. So much so, that we get only one scene with the villains in the first hour of the film. Much time is spent actually building character before we launch them into their test, and that works in this movie’s favor. It amazed me how much of this I remembered, even years later. The christmas tree scene, the jumper, the shooting range, the helicopter… ironically, it was really the last half hour that was foggy. I think that is when this movie starts to become like every other movie before it. But then, in Danny Glover’s yard, we get that iconic hand-to-hand fight between Mel Gibson and Gary Busey. Very classic stuff. This is a well above average entry into the genre, but watching it again reminded me why I still hold DIE HARD to be the quintessential 80s action flick. ~ by johnlink00 on May 31, 2011.